﻿ KOREA GPG 2013 Finals – Bae bags 1st gold at last! KOREA GPG 2013 Finals – Bae bags 1st gold at last! Bae Yeon Ju won her first Grand Prix title at the Victor Korea Grand Prix Gold in Jeonju, beating her world #5 compatriot Sung Ji Hyun in three games. Bae Yeon Ju has been to #5 in the world rankings and back and has been in the finals of three Superseries events, adding a Grand Prix Gold to that collection last year but all of this has happened since her last international tournament victory, which came at home in the Hwasun International Challenge in 2009, when she was coming off a 6-month hiatus. In fact, Bae came into today’s final as the only player in the top ten – apart from 18-year-old P.V. Sindhu – who had never won a Superseries title and one of only two top 15 players who had yet to win a Grand Prix event. 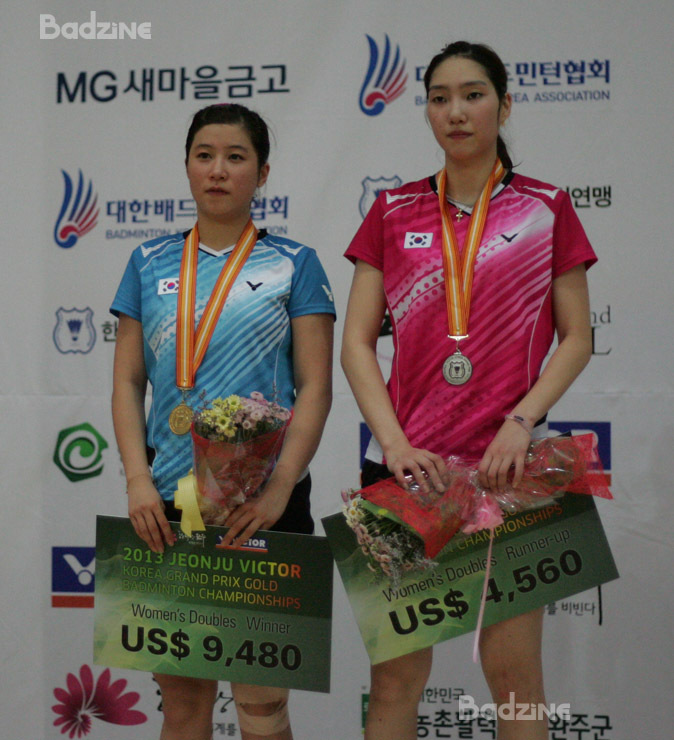 She put all that behind her in Jeonju, though, when she beat Sung Ji Hyun (pictured below) in three tough games. The lefthander won the crowd over with her fighting spirit and precision placement. She trailed throughout the second game and a late push was unsuccessful but she dominated the deciding game to come away with the victory after an hour and 20 minutes of play. “Once I made the final, I really felt hungry to get the title,” said Bae Yeon Ju (pictured below) after receiving her medal. “I was ready to run and to use everything at my disposal. “At the beginning of the match, I got out to a big lead and in the second game, I think I started to rush it a bit, because I really wanted to finish it off and win quickly. But Ji Hyun was more patient and she plays well that way anyway. “She started to move me from side to side but once I concentrated on moving her forward and then pushing the shuttle back, I got the advantage back. “I’m grateful to the crowd for their support. I wonder if they seemed to be behind me because I’m so short and I was playing so hard,” Bae laughed. “I do feel that this win is a kind of turning point for me. I’ve had that feeling so many times, getting to the final and then having to settle for second both in the Superseries and in Grand Prix events. Winning here really gives me that extra bit of belief in myself. Though Korea’s top pair Kim Ki Jung / Kim Sa Rang had already tasted international success at the Grand Prix Gold and Superseries level, they have several times been denied victory at home in close matches with their team-mates. 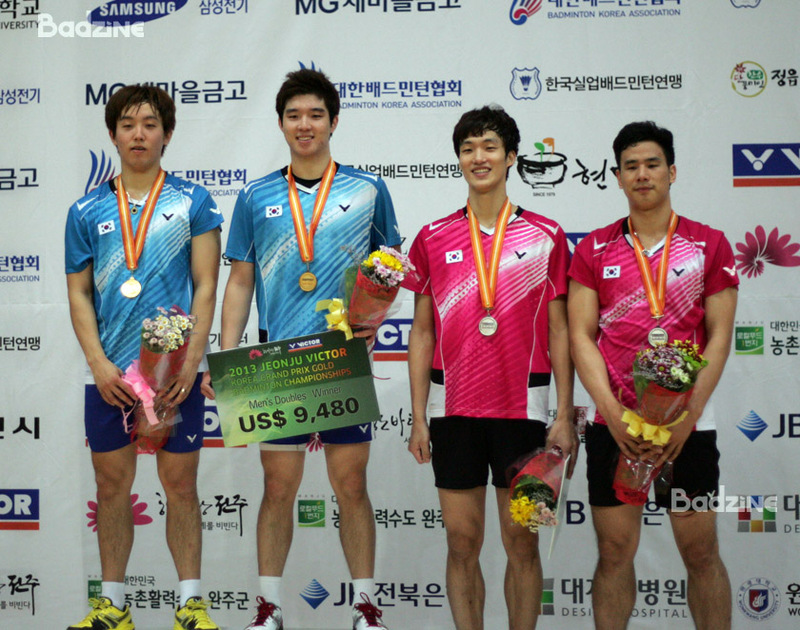 Most notably, they had to settle for silver last year in Hwasun while the then new pairing of Ko Sung Hyun and Lee Yong Dae took the honours. Ko Sung Hyun was unable to deny them a second straight time, though. A big comeback in the deciding game made it look as if Ko would indeed take a third title in as many years – and partners – as he and Shin Baek Cheol pushed ahead to be first to match point. The two Kims held it together, though, and closed out the decider 25-23 to take their first title on Korean soil. “Last year we were the runners-up so this year, once we made the final there was no way we wanted to end up second again,” said Kim Ki Jung after the match. “I think we really wanted to win this week because in the last few tournaments we lost in the first or second round each time. It’s also great to win our first title at home in Korea,” added Ki Jung, whose university is just a few kilometres from the Grand Prix Gold venue. “It’s been good that Kim Sa Rang and I have been playing together consistently for three years now. We are so used to playing each other. Ko and Shin may be a new pair but we train with them all the time so we knew how we had to play to beat them. 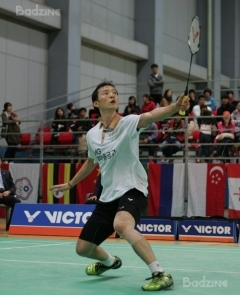 In the men’s singles final, the ever-young Lee Hyun Il (pictured) put former team-mate Hong Ji Hoon through a master-class. The 33-year-old former world #1 moved Hong about at will and came away with the win in two easy games. “Winning today wasn’t so much about building confidence,” said Lee Hyun Il after his win. “I basically played as hard as I normally do and everything worked out. “When I first entered this event and saw the draw I was thinking I’d just give it a try and see what happened. It was a much more comfortable victory than I thought it would be. I’m happy to win the first international tournament I’ve entered since the Olympics. “The ranking points from this event will be helpful for entering smaller events next year. I am not aiming for the Asian Games or the Olympics or anything like that. I will only be playing in events where the national team players aren’t competing. I won’t be under any pressure. Jang Ye Na stayed healthy this year to again finish her home Grand Prix Gold with two titles. Having done so in 2011, she was on her way to a repeat double last December when she suffered an ankle injury that sidelined her for two months. Her first appearance on finals day in Jeonju was in the women’s doubles, where she and Kim So Young (pictured right with Jang Ye Na) picked up their first title in a ranking tournament. The duo had won gold at the Universiade in July but this win, which came at the expense of team-mates Ko A Ra / Yoo Hae Won, actually marked Kim’s first ever Grand Prix title. Not so for Yoo Yeon Seong (pictured left with Jang), who was playing for a 3rd Grand Prix mixed doubles title in the past 4 Korean autumns. Yoo and Jang were flawless as they picked apart Kang Ji Wook and Choi Hye In, who were playing in their first final together since the 2010 World Junior Championships. The win was especially sweet for Yoo, who grew up in the area and attended middle and high school in Jeonju and university up the road in nearby Iksan. The crowd was reminded of the tradition Yoo was carrying on in a ceremony that was held before the finals that honoured five of Jeonju’s many illustrious badminton stars – Chung So Young, Jang Hye Ock, Kim Dong Moon, Ha Tae Kwun, and National Team Head Coach and former All England champion Lee Deuk Choon. Congratulations to all winners at the Korea Grand Prix Gold. It was the finals that all the Koreans would like to watch. They got what they wish with their dreams come true. It was indeed an all Koreans affair in the finals. Needless to say all the champions are Koreans. The new “Korean Waves” in badminton has now swept across the globe. They meant it and they achieved it. I hope you all will join me to pray for all the badminton players in the Philippines that they are safe and sound. Together with their families and loved ones, they will be able to pull through. Do not give up facing adversities. All will be fine in the end and hope to see you at the badminton courts soon!! Perhaps, the badminton fraternities would to chip in to give a helping hand to our Philippine players in whatever that they could. They may need our help.